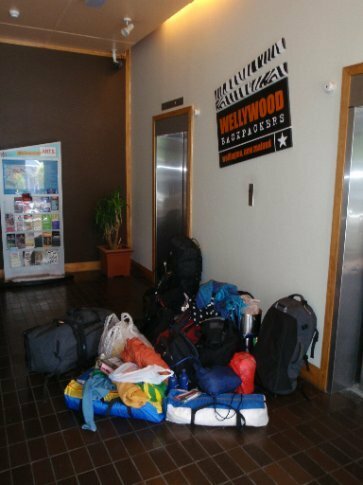 After 10 days in the car and sleeping in tents we were all quite glad to pull up to the Wellywood Backpackers in Wellington, the capital of New Zealand. The monstrous pile of camping detritus that was crammed into the lift on the way up was positively embarrassing. There was no way any of us could face piling into a dorm with our random collection of noodles, plastic cutlery, gas cookers and frying pans so we got a quadruple between the 4 of us which meant we could take a few days to gather our belongings as well as our thoughts. For Claire and I the back to life feeling hit quite quickly – she had to organise her nursing certifications so she could get working and I had arranged an interview with a recruitment agency that afternoon. Not having any interview suitable attire I made a bee-line for the Warehouse up the street to pick up some cheap, vaguely respectable clothes and tried to convince them I could, and would do absolutely anything for a decent price. I had originally planned to do some bar work but given the consistency of the news about the global downturn it made sense to try to get a more lucrative contract while I could. One interview down we went to the pub to celebrate having made it almost exactly halfway around the world – plus it was happy hour and friday night. After anti-climactic Auckland we wanted to sample some of Wellington's supposedly buzzing culture and hopefully get some live music in. After the first bar, Coyote (who serve free nibbles on a friday) we went for a bit of home comfort food at Nando's. The service was appalling so we walked out and across the road to Burger Fuel for some yummy burgers, Oli and Sylvia having joined us at this stage. Cuba St, the main bohemian strip with lots of bars did not fail our requests and it was great to get out into it, meeting a few characters along the way – a hilarious couple from Northern Ireland – he was 6 foot 7 and she was a few inches shy of 5 foot in her heels! A great motown band kept the crowd entertained with a fantastic brass section and a charismatic singer. We, or should I say I, stumbled back to the hostel. Needing the bathroom I got up in the middle of the night, wearing only boxers. On the way back I somehow took a wrong turn (in the straight corridor) and managed to lock myself in the fire escape stairwell. I knocked and shouted for a good half an hour, unwilling to set off the fire alarm by exiting the bottom door. Thankfully Claire came to my rescue eventually. It probably wouldn't have been too bad – if I had have set off the alarm everyone would have been out in the car park in their underwear! As we needed to move into a flat fairly soon in order to keep costs down, we had started calling people the previous day and had arranged one viewing for the morning. It was a short stroll up the street to visit Francesco who I was delighted to find out was Chilean sculptor. The house was pretty studentesque, with disregarded signs reminding people to wash after they cook. The other flatmates would be an Egyptian musician and a Japanese student. Perfect! We said we were interested and asked him to call back when he had decided. Te Papa, the much feted museum of New Zealand on Wellington's waterfront was to provide us with afternoon entertainment. It really is an amazing resource, very informative, interesting, interactive and actually fun. Earthquake simulators, multimedia walls, urban wildlife sactuaries and even a colossal squid (which deserves the name I assure you – eyes as big as footballs) – Te Papa has it all. We only managed 2 floors out of 6 and spent about 4 hours wandering. If you get a chance to even spend a few days in Wellington, make sure you get at least half a day there. We followed this bit of culture up with some cajun food, New Orleans style in a fab restaurant called Sweet Mothers Kitchen in busy Courtenay Place. Not many of the people I had left messages with on the flatmate front had gotten back to me – a bit of a concern given that we had only booked the hostel for another night. After a few more calls on Sunday morning we had one viewing. It was a nice modern flat on a central street – close to the hosptial - good for Claire and about 20 minutes walk from the CBD – good for me to be able to walk to work, or should I say walk to interviews. The guys renting the room were a Kiwi couple, early twenties who had just moved in – seemed fine and there was another room which had just been taken by an English couple along the same lines as us. We did the deal there and then and arranged to move in the following day. Sorted! Our Chilean friend never called in any case.